IT IS one of the Sunshine Coast's best-kept secrets: a giant mural seen by virtually no one. 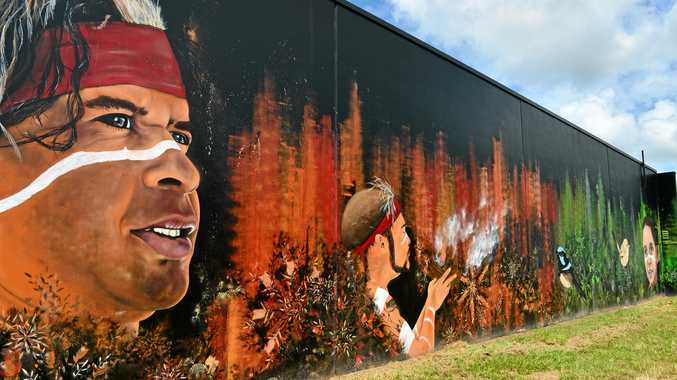 Spanning roughly 25m across the back of a building in Nambour, the striking painting representing the Gubbi Gubbi tribe should be a Coast treasure. It should be talked about in the same circles as the revamped Coast water towers, or the popular graffiti stretches of Melbourne laneways and the murals in the Tasmanian town of Sheffield. But this Nambour mural is too well hidden. The mural, featuring Aboriginal elders Lyndon Davis and Brent Miller, utilises the traditional mural and street-art techniques, including brushwork and stencils, as well as using high-quality, fade-resistant aerosol paint. The artwork reflects and celebrates the local community with its colourful images of the old corner milk bar, Collins' Cafe, and the sugar mill. Backing on to discount store Price Busters on Howard St and facing Quota Park, the mural is almost kept in the closet, despite being out on public display. In the four years since its unveiling, not one Price Busters customer has inquired about it. "No one has asked, which is a real shame," manager Uttam Raiyani said. "It is a nice thing to pay respects to the Gubbi Gubbi people and better than what it used to be." Management at neighbouring store Repco had no idea it existed. One resident who knows of it well and appreciates it even further is Norm Morwood, who is part of the Petrie Creek Catchment Care Group. "The whole mural is quite spectacular - so historical - but only the people who walk along the path behind the shops know about it," Mr Morwood said. "I only know about it as I do a lot of work along there in the native bushland behind. "It is a bit of a shame more people don't have the chance to view it."